China’s first aircraft carrier left its shipyard at Dalian Port on Wednesday morning. After a short trial, the vessel will return to the port for further refitting works, Chinese military sources say. It may take several years for the aircraft carrier to become operational. China has now become the world’s 10th nation to possess an aircraft carrier, thus underlining its naval ambitions in the region. The list of carrier-equipped countries includes the United States, France, Brazil, India, Italy, Russia, Spain, Britain and Thailand. "We're already a maritime power, and so we need an appropriate force, whether that's aircraft carriers or battleships, just like the United States or the British Empire did," Ni Lexiong, an expert on Chinese maritime policy at the Shanghai University of Political Science and Law, told the Reuters news agency. On the same day that China began sea trial of the new warship, Taiwan hailed its most advanced Hsiung Feng III missile as “an aircraft carrier killer.” It was brandished during the preview for a defense exhibition on Wednesday with a billboard depicting a missile-hit aircraft carrier on the background. Taiwan has previously deployed the missile on frigates but has never showed it off as an anti-carrier weapon. Chiang Wu-ing of the Chungshan Institute of Science and Technology said the supersonic missile has the capability to penetrate an enemy's defense system. 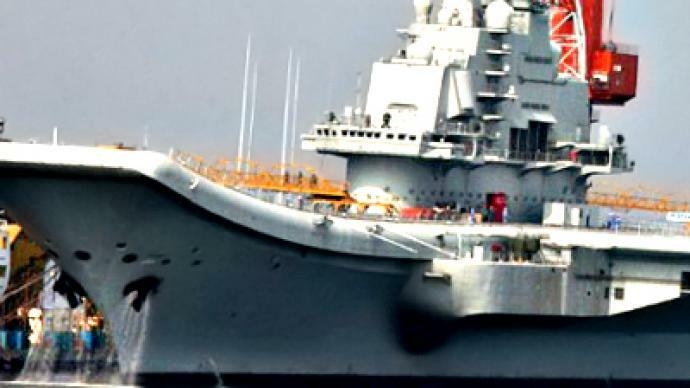 However, Chinese state media claims that the development of the warship will not change the defensive nature of the country’s national defensive policy. Xinhua news agency quotes Chinese military expert as saying that the Varyag is only a platform for scientific research, experiments and training. The vessel was constructed in the USSR and became Ukrainian property after the collapse of the Soviet Union. In the 1990s it was auctioned for US$20 million to a Hong Kong-based company which intended to covert it into a floating casino in Macau. However, Chinese authorities denied the company a casino license and the ship arrived to the port of Dalian. 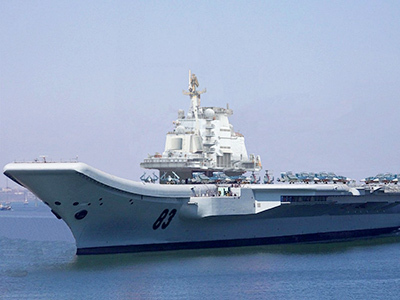 In June, Beijing officially announced that it was constructing an aircraft carrier. Taiwan split from China amid civil war in 1949. However, Beijing still claims the island as its territory and vows to reclaim it. The political relations between the sides remain strained and unstable despite improvements in financial partnership. Taiwan’s current President Ma Ying-jeou advocates that the bilateral relations should shift from "mutual non-recognition" to "mutual non-denial." Vladilen Burov, member of the Council of Directors of the International Confucian Association told RT the tension between Taiwan and China existed in the beginning of this century. “At the time, Taiwan was ruled by the Democratic Progressive Party, which wasn't interested in improving relations with the mainland. In 2008, the Kuomintang came to power in Taiwan again. It made efforts at improving relations with the Chinese mainland,” he explained. He also said today China isn't interested in military aggression or a military intrusion into Taiwan. “Rather, it wants to achieve its goal of uniting with Taiwan by peaceful means,” stated Burov. He maintained sooner or later, the Taiwanese will realize the need for establishing some sort of a confederation. “I believe the entire Chinese military exercise isn't aimed against Taiwan, but rather against its patron, the United States, as they are the leading military force in this region. There has been a fight for hegemony over this region,” he concluded.